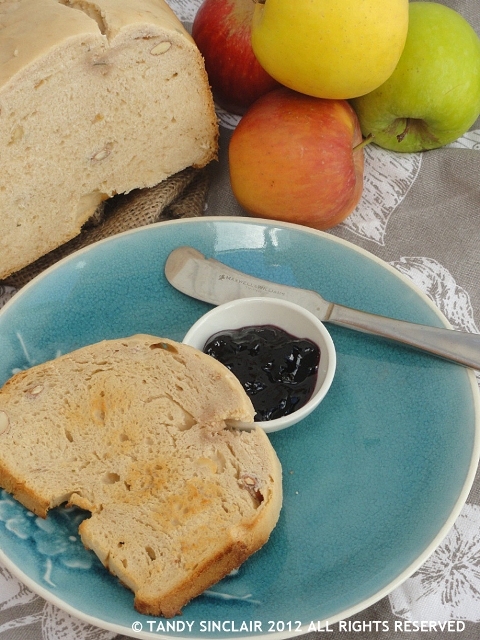 I have been experimenting using my bread maker to make jam – with some success. I had been given a selection of Apples by Sam and not wanting them to go to waste I decided to make apple jelly. I used 500g of apples and a few sprigs of rosemary (picked) to make the jam, with a combination of fructose, grape juice and citric acid. I have not got the balance quite right and the jam is still too sweet. It will make a lovely apple sauce to accompany our roasts though so it will at least not go to waste. When I saw this month’s 12 loaves challenge I decided to use the apple sauce I had made in my apple and almond bread. I have once again used the bread maker to do all the hard work as at this time of the year even though the weather is slightly better I am under a lot of time pressure. I know that as soon as our summer holidays start, I will have more time on my hands to do the hard work involved in making bread. This apple bread was really lovely. You got a hint of apples in the taste and it made a really good, tasty breakfast bread. do you make your own jams? I am submitting this recipe to Twelve Loaves which is hosted by Jaime, Lora and Barb. This bread sounds delicious! I’ve made jam, but I haven’t used citric acid…this is a new ingredient for me (it is also in your bread recipe! ), interesting. Nice combination of apple and almond…nothing like a slice of bread fresh out of the oven…yum! A lovely looking bread, dear Tandy! It looks scrumptious too! I only make a few jams per year but my mom is an award-making & ethousiastic jam maker. She comes iup with the most great combo’s of fruit & spices, etc! My favourite recipe of her jam is cranberry, redcurrants & raisin jam! This bread looks amazing! Warm slice of bread with some jam and tea, just perfect! I bet this bread would make for some awesome peanut butter and jelly sandwiches! SOunds delicious! Ooh, the apple and almond sound fantastic in this bread. I have never used apple sauce in a bread, but this sounds great. I like the addition of almonds for a bit of texture. The almonds were a bit soft but still added texture, if that makes sense? What a fabulous idea – bet it was amazing! I’m not very fond of sweet bread but your loaf looks lovely. I am always thrilled when a good friend bakes for Twelve Loaves! And this bread is a must-try! I love the addition of applesauce (and homemade!). It must taste marvelous, Tandy. Beautiful!